JJs Yard2 is located in city center of Lagos, surrounded by coffee shops, restaurants, bars,and walking distance from the beaches. What makes JJs Yard different is that you get the freedom to be yourself in your own space, meet new people and enjoy what Lagos has to offer. 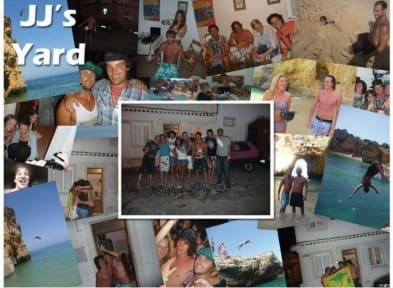 At JJs yard 2you will meet travelers, build friendships and also get to meet the owners Jay and J Lorena, who are always happy to give out information on kayak trips, surf trips, Yoga, water sports, booze cruise's and much more. 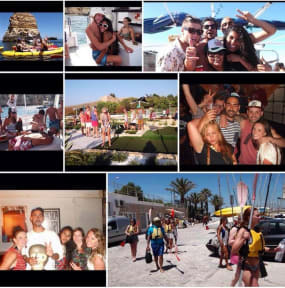 JJs Yard really does feel as if you are away in a rented house filled with people who just like to have fun! Enjoy eating out? At JJs Yard we arrange dinners for the guest to try out some of the restaurants in town, if your travelling solo this is a great way to make new friends and have a good time! Come join us and experience Lagos at its chilled relaxing time, great for those who want to connect more with nature, explore the cliffs, beaches, mountain biking, visit wineries, try out some surfing around the west coast and also enjoy yoga classes next to our guesthouse. In the city center where we are located you will get to check out some of the amazing restaurants, small coffee and local shops, we will be happy to help arrange an activity available at the time..
Our guesthouse is always kept clean and tidy. JJs Yard cannot accommodate anyone under 16 years of age or over 40. Our check in is at 3pm but if you come earlier we have a secured area where you can leave your bags free of charge! Cash machines available within a few minutes walk from the guest house. Our cancellation policy is 72hrs. Cancellation 72 hours prior to the arrival date. In the event of late cancellation the cost of the first night of your stay will be charged. In the event of No Show, the total balance will be charged. JJs Yard is not responsible for loss, damage or theft of cash, jewelry or other valuables left unattended in guest rooms or the hostel premises during your stay. A key deposit is charged upon arrival and refunded back once keys have been returned on check out! JJs Yard reserves the right to either ban or ask a guest who is acting highly inappropriate to leave the premises without a refund. JJs Yard reserves the right to hold guests liable for any property damage guest may cause during their stay. Me and Stefan really enjoyed our time here. Our plan was to stay a week in lagos but after that week we become friends with the pro minigolfer and owner Jay and his Lovely and shy staff rickie😉. We decided to stay for another week. The atmosphere was like meeting best friends. Laughing, nice conversations, barbecue, awesome pubcrawls are part of that journey through lagos with Jay. We met his lovely wife lorena in that second week. She is like a big sister and mom. We are coming back for sure. Great place with awesome owners. Just be warned if you're not traveling in summer that they do not have a heating / air condition system so it gets very cold, especially during the night. Really funny and helpful staff. Really good located. J had a lot of insider infos for us. Meine Freundin und ich waren 3 Nächte im Hostel. Die beiden Besitzer waren wirklich unglaublich lieb und hilfsbereit. Unser Zimmer war direkt an der Terasse gelegen. Es war nachts sowie früh morgens sehr laut und es wurden auch oft die Türen auf und zugeschlagen. Die Matratze war sehr durchgelegen und das Bett wackelt sehr. Die angebotenen bar crawls sind umsonst, dafür muss sich dann Selbstversorgen. Beer Pong wurde zu unserer Verwunderung mit Wasser gespielt. Die Lage ist ausgesprochen gut.